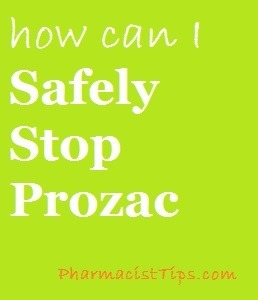 How do I stop taking Prozac [fluoxetine] safely? Do I need to taper off? Prozac (and the generic fluoxetine) is an SSRI or a Selective Serotonin Reuptake Inhibitor. The SSRI’s are used to treat depression. Fluoxetine may also be used to treat other conditions such as OCD, premenstrual dysphoric disorder (PMDD), panic and certain types of bipolar depression. It is available in 10 mg, 20 mg and 40 mg capsules and tablets. Typically the SSRI are associated with withdrawal symptoms when the medication is stopped or the dose is reduced. Potential symptoms include: dizziness, nausea, fatigue, flu-like symptoms, headache and difficulty sleeping. Stopping Prozac is different than stopping other SSRI’s like Lexapro. Prozac is an antidepressant that takes a long time to get out of your system. The half-life is 4 to 6 days, where as Lexapro has a half life of 27 to 32 hours. That means it takes a long time for the body to clear Prozac from the system. Never stop any antidepressant without the approval of your doctor. Depression is a serious condition and if you feel one medication is not working there are many other options. 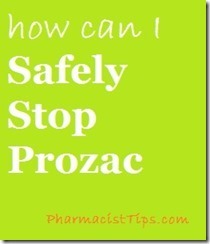 When stopping Prozac or the generic fluoxetine there is usually no need to taper. It is eliminated from the body so slowly few people have withdrawal symptoms. In fact, some doctors recommend switching to fluoxetine from other SSRI’s and then stopping as it reduces or eliminate the chance of withdrawal symptoms. Always speak to your doctor or pharmacist if you feel you are experiencing side effects from any medications. Do not change your dose or stop medications without the help of a licensed healthcare professional.